Since 1/03, DhhEAF has reached over 2,500 Deaf and hard of hearing students by emphasizing education and fitness & health in a weekly introductory schools program. DhhEAF's goal is to affect academic improvements, self-esteem enhancement, and good citizenship qualities so that DHH youth will become better students, leaders and upstanding individuals. We have reached Los Angeles, Orange, and Riverside County schools where a DHH Program is in place. Please find Letters of Endorsement from teachers as well as students. DhhEAF is the only program of its kind in the U.S. It's explained to the students that participation in the DhhEAF Program is to be treated like a scholarship. Students are to maintain attention to education AND good behavior at school as well as at home. Quantifiably, our progress can be measured by increased numbers of participants, improved attitudes, enhanced familial interaction, and kids having FUN. Since tennis is a life-long game where the rules are universal, our young charges will be able to play wherever they live, for the rest of their lives. To that end, the benefits of long-term health (obesity, HBP, diabetes, etc. ), cultural pride/understanding, and a network of friendship will take longer to evaluate. And 25 years from now, they'll be able to hit tennis balls and bond with their own children........Priceless!!! 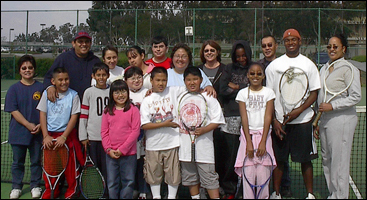 Roy gave the first tennis DHH Tennis Clinic in Southern California at University High School in Irvine in the Spring of 2002. It was so well received that he was determined to do more. 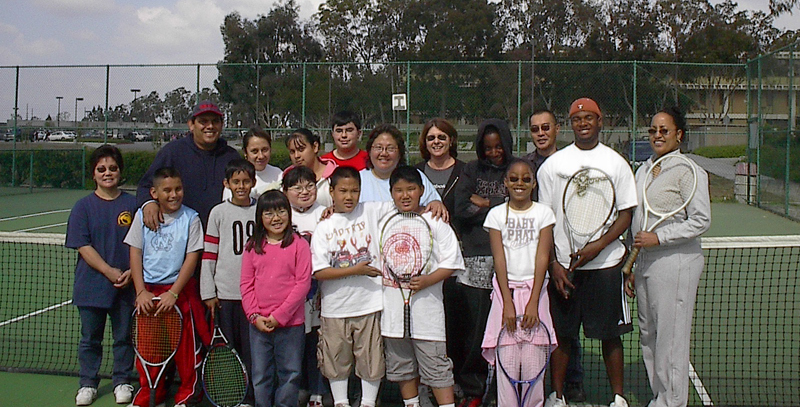 After our approval by Community Partners in the Fall, we began our regular schools program in January '03. Since then, we have experience at over 25 schools, directly reaching over 2,500 DHH students. DhhEAF is an approved project of Community Partners, a nonprofit charity exempt from federal income tax under Section 501(c)(3) of the Internal Revenue code, and which is not a private foundation because it is described in Sections 509(a)(1) and 170(b)(1)(a)(vi) www.communitypartners.org Contributions are tax deductible to the extent permitted by law. Checks should be made payable to: Community Partners FBO (for the benefit of) DhhEAF. As our Fiscal Sponsor, CP handles our administrative responsibilities including payroll, audits, & insurance thereby allowing us to concentrate our expertise on the DhhEAF Program. Each CP Project is responsible for its own budget & fundraising. Community Partners (Tax ID # 95-4302067) has an excellent reputation in the nonprofit world and it was our first milestone to have been approved as their first "athletic" approved Project. Because we work with children, Community Partners requires fingerprints and background checks and we pay additional insurance costs. They provide administrative & accounting services including payroll and taxes, in addition to training and consulting in the nonprofit arena.